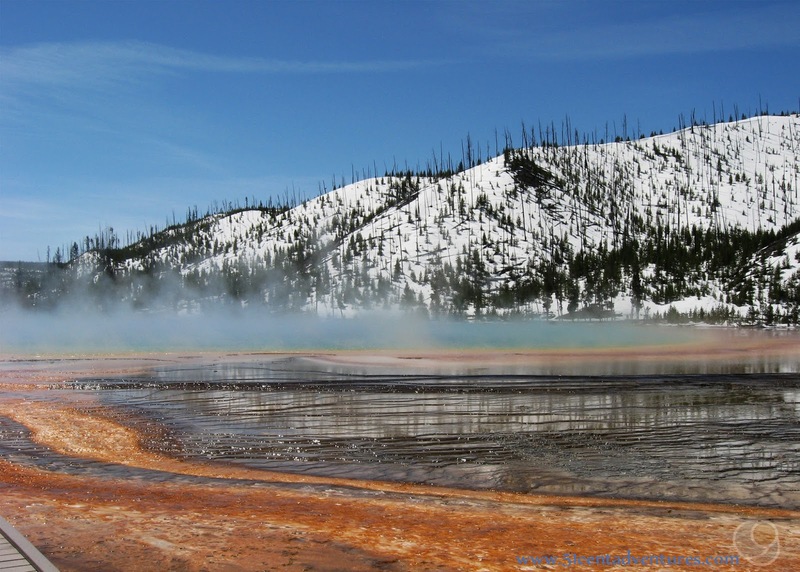 Grand Prismatic Spring is one of the most iconic features of Yellowstone National Park. The spring is the third largest hot spring in the world. The brilliant blue water of the spring is ringed by colorful algae that surrounds the spring in vibrant greens, yellows, and oranges. You can view the spring from a boardwalk that runs near the spring, or you can view it from an overlook on a small hill. 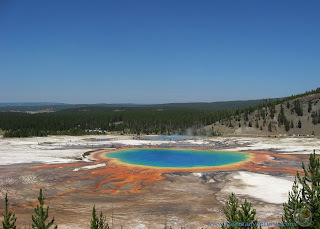 Location: Grand Prismatic Spring is located on the western side of the lower half of Yellowstone's Grand Loop road. It is approximately 6.5 miles from the Old Faithful area. 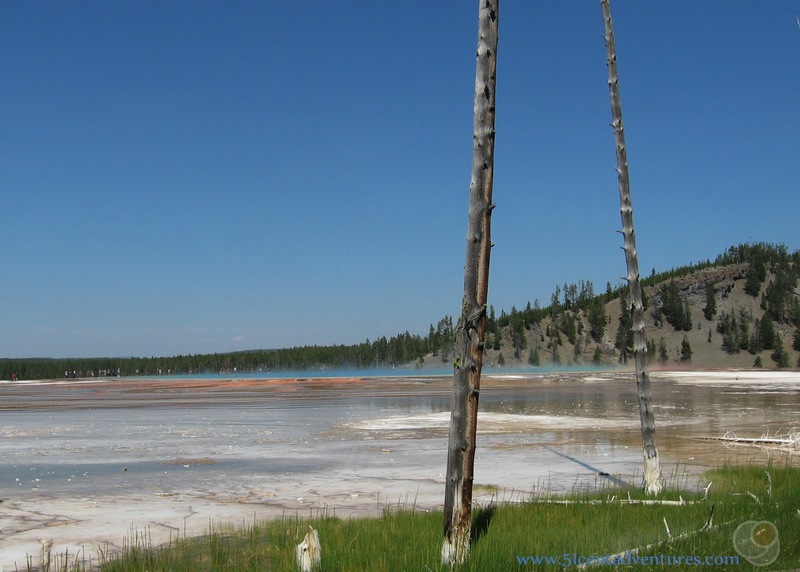 The boardwalk is located at the Midway Geyser Basin. The Overlook is accessed from the Fairy Falls Trail. Hiking Distance and Time: .5 of a mile on the boardwalk or 1.2 miles round trip to the overlook. Open Season: The boardwalk is accessible from late April through late October. The overlook trail is closed until the Friday before Memorial Day due to bear management. In the summer of 2017 I received a job with Xanterra Parks and Resorts in Yellowstone National Park. I moved there with my husband and our four young children. We lived in a 25 foot RV and spent all our free time exploring the park. 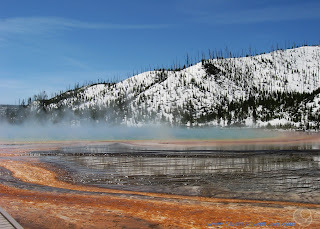 This is the fifth of many posts that I will write about specific features within Yellowstone National Park. At first these aren't going to be in any particular order, but in a few months I'll start grouping them into lists. This one would probably fit into a list such as "See This, Not That." 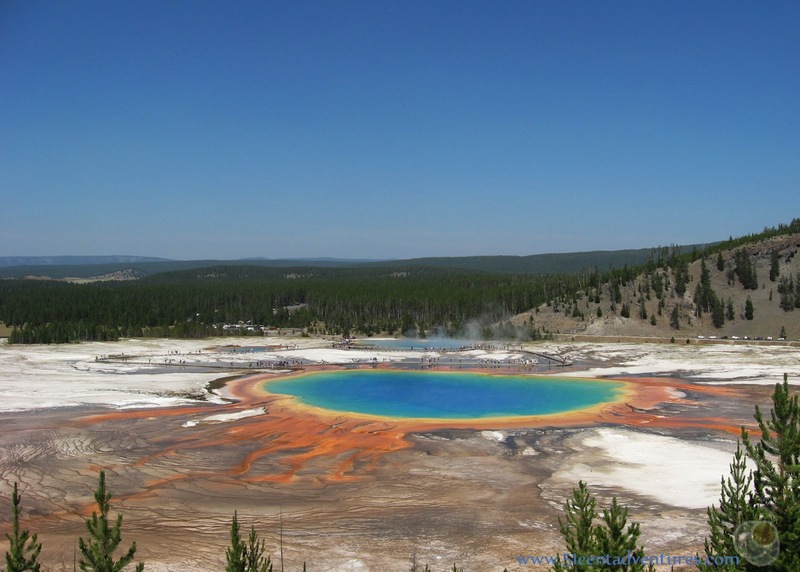 The Grand Prismatic Spring is one of the most iconic features inside Yellowstone National Park. You will definitely want to include a stop at this spring on your list of things to see in Yellowstone. As of the summer of 2017 there are officially two ways to view the spring. You can view the spring from the boardwalk in the Midway Geyser Basin, or you can look down on the spring from the top of a small hill accessible from the Fairy Falls Trail. Boardwalk at the Midway Geyser Basin. 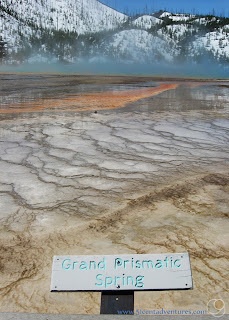 The traditional way to view the Grand Prismatic Spring is to walk next to it on the boardwalk. The spring is located in the Midway Geyser Basin. You park in a medium sized parking lot and then walk across a bridge built over the Firehole river. Before we go any further we NEED to talk about this parking lot. Good luck finding a parking spot in here between 9:00 am and 6:00 pm in June, July, or August. This is one of the most popular tourist centers in the park, and the parking lot does not have enough space to hold everyone. Parked cars are usually lining the Grand Loop Road for at least a mile around the Midway Geyser Basin. My husband once turned into this parking lot by accident on a busy day in July, and it took him 15 minutes to circle around and get out of the parking lot. Even if/when you do find a spot to park you will be walking the boardwalk with hoards of tourists. What I'm trying to say is: YOU DO NOT WANT TO VISIT MIDWAY GEYSER BASIN/GRAND PRISMATIC SPRING DURING PEAK TOURIST TIMES. 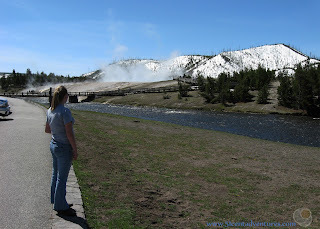 When my husband and I visited Yellowstone in 2008, we went there in mid-May. 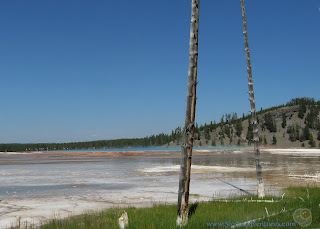 We had a great crowd-free visit to the park and basically had the Grand Prismatic Spring Area to ourselves. During our summer of living in the park in 2017 we went to the Grand Prismatic Spring around 8:30 on a Sunday evening. There was hardly anyone there that time too. Okay now that we've talked about that we can get on with the tour. After you cross the bridge you will come to Excelsior Geyser. This hasn't been an explosive geyser in decades, but it still pumps out the most water of any geysers in the park. It puts out 4050 gallons a minute. My husband thought he would be clever and pose with a water bottle next to this giant spring. 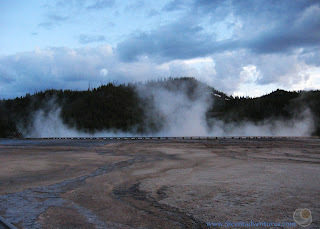 The board walk snakes around and you'll get a view of Grand Prismatic Spring. The boardwalk will take you next to the hot spring. When the air is cold it's hard to see the spring head-on because there is so much mist. The spring is surrounded by algae mats which grow in different colors depending on the temperature of the water. Its always amazing to see the colors of the algae reflected in the mist. As pretty as the algae is, you may be disappointed by the Grand Prismatic Spring. Every promotional picture of the spring is from the above so looking at the spring from the boardwalk can be underwhelming. 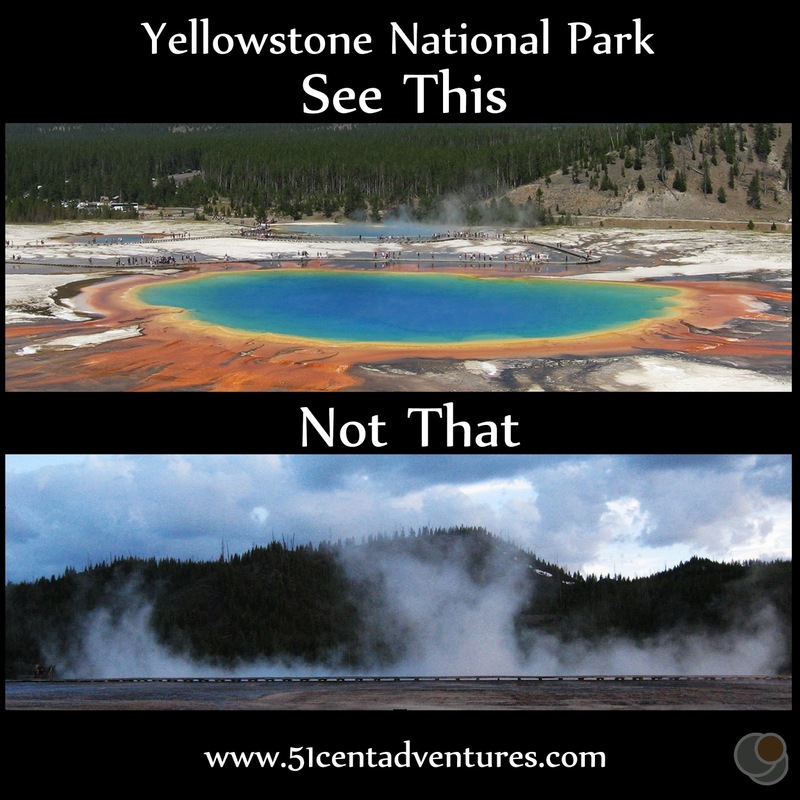 And that's why there is now a second option for how to see the Grand Prismatic Spring. 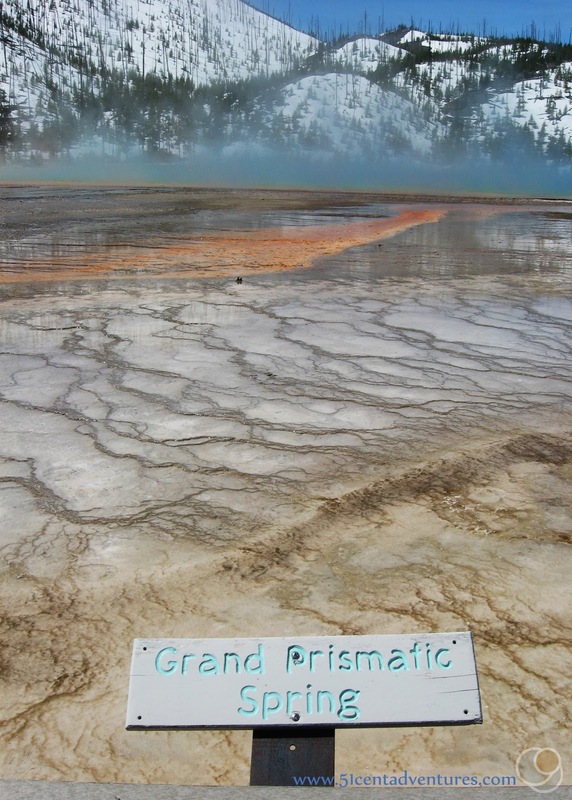 For years this option has been something of an insider's secret for how to get the best view of the Grand Prismatic Spring. People have created unofficial trails up a hill accessed by the Fairy Falls trail, These trails were causing erosion on the hill and weren't in great shape. Finally the National Park Service decided to put in an official trail that leads to an official overlook on the hill. The overlook was finished in July of 2017 and became and instant hit. Since this is still relatively new, the crowds of tourists at the Fairy Falls Trail Parking lot aren't as bad as at the Midway Geyser Basin Parking lot - yet. But this is bound to increase in popularity so I'm going to repeat my earlier tips about when to visit this area. If you want to avoid crowds you'll want to visit this area early in the morning or in the evening. I would recommend going there in the morning because then you'll have time to continue hiking to Fairy Falls and Imperial Geyser. 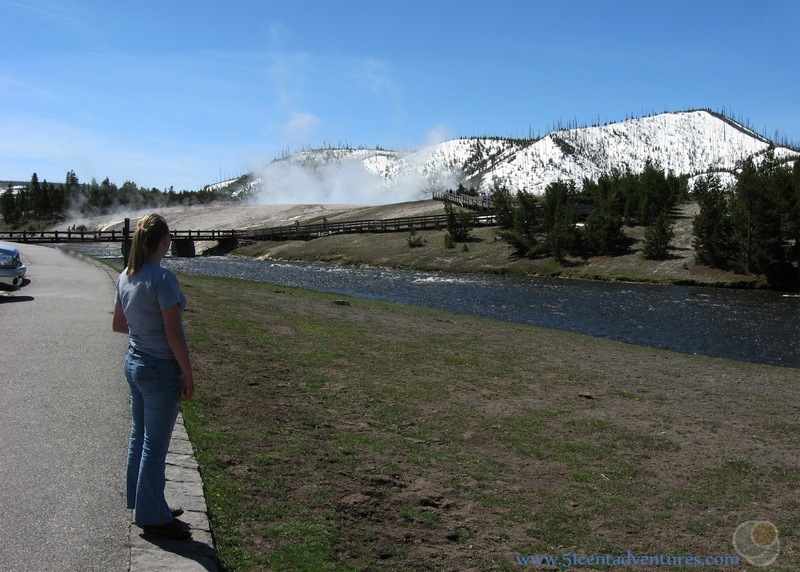 Just like the Midway Geyser Basin, you'll park and then cross a bridge over the Firehole River. 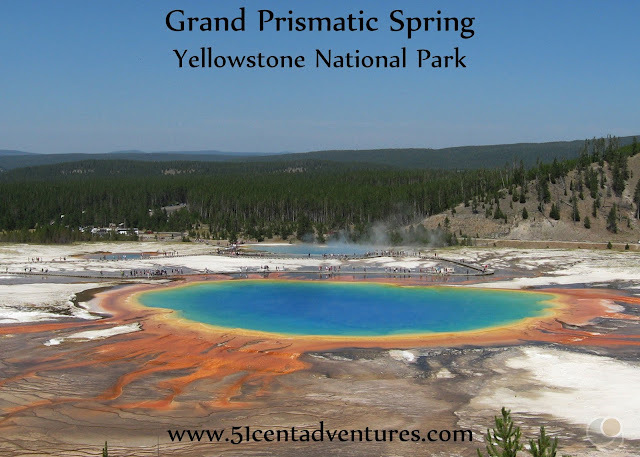 After hiking about a mile you'll be able to see the Grand Prismatic Spring. The trail will split. The main part of the trail continues to Fairy Falls (and I highly recommend continuing that way after this little side visit) while the left hand trail heads up the hill to the overlook. This spur trail is about 1/4 of a mile long. It looks kind of steep, but it doesn't last long and the view is worth your effort. Near the top of the hill is a nice overlook. The whole thing is on a cement pad with sturdy guard rails around the edges. But you would be happy standing anywhere with a view like this. During an ideal visit to the park you would have time to walk near the spring on the boardwalk in the Midway Geyser Basin, and then drive to the Fairy Falls trail head parking lot and take a hike on the trail up to the overlook. However, if time or parking restrictions force you to choose just one way to view the springs then I highly recommend hiking to the overlook. Grand Prismatic Spring is much more picturesque from above than the side. Recommendation: Grand Prismatic Spring should be on everyone's itinerary for a trip to Yellowstone. Make sure you are not planning your visit during peak tourist times. And be sure to include a hike to the overlook in your plan. Directions: Midway Geyser Basin is aptly named. It is roughly midway between the Old Faithful Area and the Madison Area on the western side of the Lower Loop of the Grand Loop Road. Midway Geyser basin is labeled well on most maps and there is a sign for it on the road. The parking lot is on the western side of the road. The Fairy Falls Trail Parking lot is 1.5 miles south of the turn off for the Midway Geyser Basin. It is not as well marked and does not show up on all maps yet. But the parking lot is visible from the road so you should find it okay. Next Stop: After you've viewed the spring from the overlook it's time to get back on the Fairy Falls Trail and keep hiking to the waterfall. Trust me, this will be worth the effort. 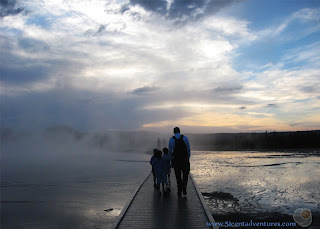 If you only have time for one hike in Yellowstone, this should be at the top of your list. 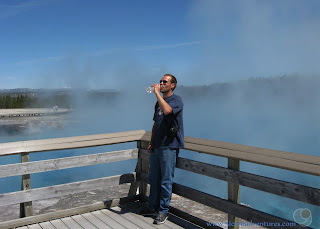 You've already seen the third largest hot spring in the world, now you can see one of the best waterfalls in the park, and a geyser which I consider to be the best kept secret in the park.